Production: Gainsborough Pictures, Ltd. for Gaumont-British Corp.; black and white, 35mm; running time: 76 minutes. Released 25 April 1934, London. 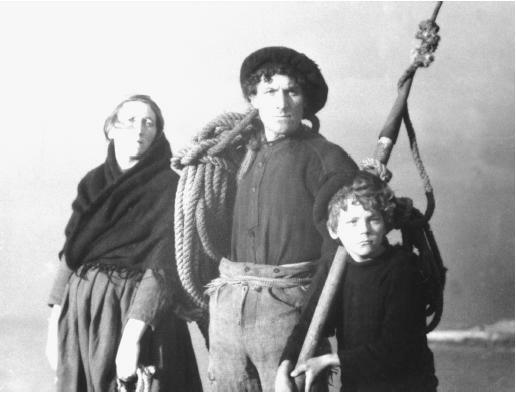 Filmed approximately 1931–33 in the Aran Islands, off the coast of Ireland. Producer: Michael Balcon; screenplay: Robert Flaherty with Frances Flaherty, with scenarist credit for John Goldman; photography: Robert Flaherty, David Flaherty, and John Taylor; editor: John Goldman; sound: H. Hand; music: John Greenwood. Cast: Colman "Tiger" King ( A Man of Aran ); Maggie Dirrane ( His wife ); Michael Dillane ( Their son ); Pat Mullin ( Himself ); Patch Ruadh ( Red Beard ); Patcheen Flaherty and Tommy O'Roarke ( The Shark hunters ); Patcheen Conneely, Stephen Dirrane, Mac McDonough ( The Curragh men ). Award: Venice International Film Festival, Best Foreign Film, 1934. Griffith, Richard, The World of Robert Flaherty , New York, 1953. Quintar, Fuad, Robert Flaherty et le documentaire poetique , Paris, 1960. Flaherty, Frances, The Odyssey of a Film-Maker: Robert Flaherty's Story , Urbana, Illinois, 1960. Clemente, Jose L., Robert Flaherty , Madrid, 1963. Cuenca, Carlos Fernandez, Robert Flaherty , Madrid, 1963. Calder-Marshall, Arthur, The Innocent Eye: The Life of Robert J. Flaherty , London, 1963; New York, 1966. Klaue, Wolfgang, editor, Robert Flaherty , East Berlin, 1964. Agel, Henri, Robert J. Flaherty , Paris, 1965. Napolitano, Antonio, Robert J. Flaherty , Florence, 1975. Murphy, William T., Robert Flaherty: A Guide to References and Resources , Boston, 1979. Williams, Christopher, Realism and Cinema: A Reader , London, 1980. Rotha, Paul, Robert J. Flaherty: A Biography , Philadelphia, 1983. Barsam, Richard, The Vision of Robert Flaherty: The Artist as Myth and Filmmaker , Bloomington, 1988. Rotha, Paul, in Sight and Sound (London), Summer 1934. Sennwald, Andre, in New York Times , 19 October 1934. Variety (New York), 23 October 1934. O'Neil, Brian, in New Masses (New York), 30 October 1934. Ferguson, Otis, in New Republic (New York), 7 November 1934. Grenville, Vernon, in Commonweal (New York), 9 November 1934. Greene, Graham, "Subjects and Stories," in Footnotes to the Film , edited by Charles Davy, New York, 1938. Sadoul, Georges, "Hommage à Robert Flaherty," in Lettres Françaises (Paris), 13 September 1951. Kempe, Fritz, "Robert Flaherty und seine Film," in Film Bild Ton (Munich), December 1952. Flaherty, Frances, "How Man of Aran Came into Being," in Film News (New York), no. 3, 1953. Lee, Rohama, "Flaherty's Finest Film," in Film News (New York), no. 3, 1953. Martin, Marcel, "Robert Flaherty," in Anthologie du cinéma 1 , Paris, 1965. Van Dongen, Helen, "Robert J. Flaherty," in Film Quarterly (Berkeley), Summer 1965. Armes, Roy, "Flaherty and the Idea of Documentary," in Film and Reality: An Historical Survey , Baltimore, 1974. Van Dongen, Helen, "Robert J. Flaherty," in Non-Fiction Film: Theory and Criticism , edited by Richard Barsam, New York, 1976. Hitchens, G., "How the Myth Was Made," in Film Library Quarterly (New York), no. 3, 1978. Vogel, A., "Independents," in Film Comment (New York), March-April 1979. Lerner, Jesse, "Flaherty in Motion: The 38th Annual Robert Flaherty Film Seminar," in Afterimage (London), vol. 20, no. 5, December 1992. Kaneko, Ann, "40th Annual Robert Flaherty Seminar," in Afterimage (London), vol. 22, no. 4, November 1994. Short review, in Télérama (Paris), no. 2357, 15 March 1995. Marks, Dan, "Ethnography and Ethnographic Film: From Flaherty to Asch and After," in American Anthropologist , vol. 97, no. 2, June 1995. Pilard, Philippe, and Richard Leacock, "Robert Flaherty," in Positif (Paris), no. 412, June 1995. Goldstein, Yosha, "Here's Looking at You: 41st Annual Robert Flaherty Film Seminar," in Afterimage (London), vol. 23, no. 2, September-October 1995. Leacock, Richard, "In Defense of the Flaherty Traditions," in Film Culture (New York), no. 79, Winter 1996. Pennebaker, D.A., "Looking Back: Film Directors Robert Flaherty, Michael Powell and Jean-Luc Godard," in Sight and Sound (London), vol. 7, no. 4, April 1997. Third in the corpus of Flaherty's four major films, Man of Aran is preceded by Nanook of the North (1922) and Moana (1926), followed by Louisiana Story (1948). It shares—in some ways makes most pronounced—the special beauties and difficulties his work presents. Its blend of idiosyncratic anthropological observation, a story constructed, for the most part, from non-fictional materials and enacted by non-actors, and the understanding it offers of the essentials of human existence are what make Flaherty's work uniquely valuable— sui generis . Man of Aran has in common with the other films, as principal cast of characters, what anthropologists call the nuclear family—more appropriate to Inishmore than to Samoa. There is the strong and experienced father, the helpful and caring mother, and a boy (who moves increasingly towards the centre of the films—both as their subject and point of view—becoming dominant in Louisiana Story .) The mother in Aran is a stronger and more important figure than she is in the other films. Nature is prominent—preeminent you might even say—water and boats, hunting and fishing abound. In short it would seem the conditions in his films are much like those Flaherty grew up amidst in Northern Michigan and Canada, son of a mining engineer with Indians (as he would have called the native Americans) for companions. These common elements may represent Flaherty's way of seeing the variegated cultures in which he set himself; they certainly become a major part of the substance of his films, organized along a simple chronological narrative line. In Aran he was attempting to repeat the very considerable success of Nanook ( Moana , because it lacked Nanook 's drama it was thought, received almost no distribution) and also to move on from it. In Aran the story becomes more articulated and coherent than in Nanook ; more dramatic than in Moana . It still has the separate sequences dealing with various aspects of work for subsistence, but the identification is now more loosely with the son; frequently we take on his point of view. The scene in which the basking shark first appears below the cliff like a sea monster is pointed and masterful in this respect. And the drama of the storm concludes the film on a cosmic scale with the family—father, mother, son—surviving together after danger and loss in the face of the vast overwhelming sea and giant unyielding rock. But is was exactly these elements of story and drama, the concentration on the elemental struggle that faced 20th-century Aran, that caused the film to be subjected to angry criticism—particularly from the political left in those years of deep economic depression. Rather than having the islanders recreate the capture of basking sharks, which they hadn't done for 60 years, why hadn't Flaherty dealt with the real and present economic concerns like absentee landlordism that plagued the society? The answer to that question seems to be that that was not what Flaherty saw, or what interested him anyway. Though they had had some famous rows over these exact same issues, his old friend John Grierson, founder and leader of the British documentary movement, who had helped Flaherty set up the production of Man of Aran , came to his defence. Grierson singled out one of the detractors, "whose article puts the principal objections: that Flaherty is a romantic escapist and that the film is only so much idyllic fudge. As I originally, I think, invented the word 'escapism' [in response to Flaherty's earlier work] . . . it may seem scurvy in me to double-cross a supporter. But I do not agree with his estimate either of Flaherty or Man of Aran ." But what ultimately seems most important in Man of Aran , as in all his films, is Flaherty's special use of the film medium, which grew out of his creative impulse. Stated simply, he used film to show people he loved and admired the rest of us. He was not an anthropologist; he idealized and interpreted as an artist does, a visual poet in his case. The view he offers is his view, admittedly. In some respects his films are as much about him—his pleasures, his prejudices, his convictions— as about the people he was filming. Often he set them back in time to recapture and preserve cultures that were disappearing, and he always presented them at their finest, simplest, and noblest, gaining their cooperation to achieve this presentation. But Flaherty did not invent or glamorize. Aran and the rest were not created from make-believe or fakery; all that he shows did happen or had happened. To patronize Flaherty as a "romantic," as Paul Rotha and others did in the 1930s, seems to me to miss the point. One can see what Rotha is thinking of if the people and settings Flaherty chose and the way he chose to present them are linked with the noble savage of Jean-Jacques Rousseau and the idealized landscapes of early 19th-century painters. But Flaherty's films have little to do with the romanticism of the romantic movement, resting as it does on individual imagination and subjective emotions. On the contrary, his work might be said to be "classical," as I understand the romantic/classical dichotomy; it is spare and uninvolved with individual psychologies. He seems like a genial pagan or a prefall Adam—lacking interest in Christian notions of sin and guilt in any case. Flaherty worked with what he understood and said what he had to say. That statement was, throughout his work, that humankind has an innate dignity, and that beauty dwells in its patterns of survival and existence. Considered in this way, Man of Aran takes its proper place as a master work within the Flaherty canon.